So why should a Boston sports fan who doesn’t like Lebron James and doesn’t care about the Golden State Warriors watch this year’s NBA Finals? This is a match up between two usually doormat franchises. Cleveland has only one trip to the finals in their history, and they were swept by the Spurs that time in 2007. The other most famous points in their history are Michael Jordan hitting the game winner over Craig Ehlo in 1989 and Lebron James’s decision to leave Cleveland for Miami in 2010. Since then, Lebron and Dan Gilbert made up, Kyrie came on, and now Cleveland can complete a fairy tale. Golden State has only won one championship, and that was way back in the days of Rick Barry, Jamaal Wilkes, and head coach Al Attles in 1975. Since that time? They cost themselves repeatedly in the draft, trading Robert Parrish and the 3rd pick in the 1980 draft to the Boston Celtics for the top pick, which they used to get Joe Barry Carol. The results? Boston got Parrish and used the 3rd pick to get Kevin McHale, won 3 Championships in the following decade, while Parrish and McHale went onto the Hall of Fame. The Warriors descended into the basketball abyss and would not get up until they drafted Chris Mullin in 1984. They would then build, dismantle, rebuild, and redismantle seemingly every other year for the next 15 or so years. Run TMC, Chris Webber, Baron Davis, so on and so forth. Then Steph Curry arrived, and the team we see today began to take shape and now they’re in the finals. Neither of these franchises have great history, there is no rivalry between these teams now, there is nothing in these team’s past to suggest that it’ll be a great series. And yet, I will watch this series with great interest and enjoyment. Why? 3 reasons. 1. These are the two best basbetball teams in the world. Entertainment to follow! Yes, I am an unabashed Celtics fan. Yes, I care about the C’s above all else in the basketball world. Yes, I hope Paul Pierce come back to the C’s and not to the Clippers this offseason. But I am a general basketball fan. I’ll watch any hoops game of its a compelling and good enough matchup. Thankfully this one is a great match up. The records and highlights are as follows. Golden State: 67-15, 46-3 at home this year including playoffs. They have the best shooting backcourt in the league in Klay Thompson and Steph Curry, and a talented front court that has won me over in Draymond Green and Andrew Bogut, and a skilled bench with Andre Iguodala and David Lee. They are the best team in the NBA. And they have a worthy opponent in the finals. Cleveland: 53-29, 12-2 in the playoffs this season. This team revolves around the superpowers of Lebron and Kyrie. Even without key players Anderson Varejao and Kevin Love, this team fought their way here. The play of role players, like Tristan Thompson, J.R. Smith, Timofey Mozgof, and Iman Shumpert has been crucial to a revival season in Cleveland. They’re trying to imitate my beloved 2008 Celtics as a team to go from a losing record in one season to winning it all the next season. They are the best team in the East, and they will give the Warriors fits. 2. Mark Jackson calling the series. ESPN’s top basketball broadcasting team, Mike Breen, Jeff Van Gundy, and Mark Jackson, will be calling the NBA Finals this year. Breen is excellent as a play-by-play man, though he’s not my favorite, that would be Kevin Harlan. I still enjoy Breen’s style. Van Gundy and Jackson are both excellent commentators in their own right, but Jackson has an interesting perspective on this series. He coached the Warriors last season! And was unfairly removed from his job, in my opinion. He will be able to provide interesting insight on the team and I will be interested in the dynamic of his broadcasts. Will he want his former team to lose? To win? Will he keep professional with a few momentary outbursts one way or the other? We’ll have to see. Yes I am now officially that guy. I’m not quite the guy that belongs in this picture though, as I know my team for sure. 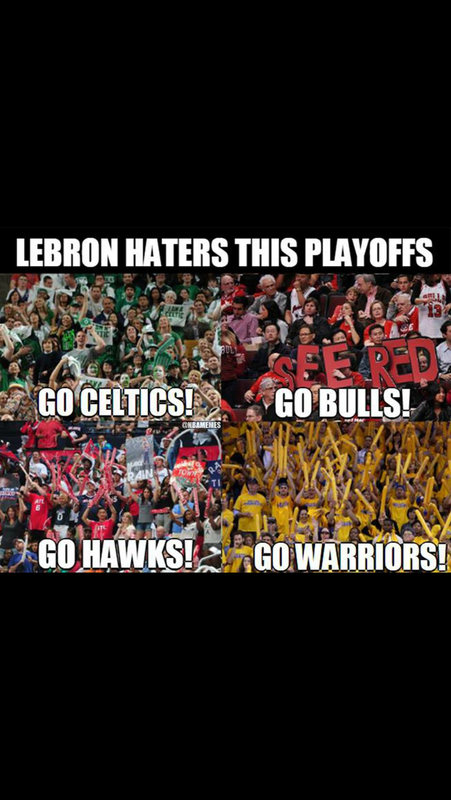 Regardless, I’m not a Lebron fan. I started watching basketball in about 2006, when Lebron and the Cavs played in Boston, and had an epic duel with Paul Pierce. Since this day, I’ve lived Pierce with a passion and opposed Lebron with equal passion. Plus, I’m a bitter Celtics fan. . He beat my team! I mean we broke his heart in 2008 and 2010, but he broke ours in 2011, 2012, and this season! I was in the arena when he led the Cavs to beat us. So yes, I’m a bitter C’s fan. But I still don’t pull for Lebron and I will root against his teams until the end. While I know it’d be an amazing story if he won a title in his first year back in Cleveland and an awesome thing for Cleveland, I’m sorry. I can’t bring myself to support Lebron on an NBA floor. Unless he plays for the C’s and I know that won’t ever happen. So there you go. Good basketball with interesting broadcast subtext and a guy I love to hate. I’ll enjoy the 2015 NBA Finals! ← Mohonk Golf: Woodchuck Golfing at its most Fun!